The Henry Hoover Range 2019 - Which is the Best Henry Hoover? The Henry Hoover Range – What are the Differences in 2019? Most people will have heard of Henry the Hoover, the smiling vacuum that has now been cleaning UK households and workplaces for more than thirty years. But did you know that there is a whole Henry the Hoover family? British manufacturer Numatic have expanded the Henry Hoover range over the years to provide Henry with some company. Some of the vacuums within the Henry Hoover range are very similar, but others do have some key differences. Below we provide further detail about each vacuum, so you can identify the difference between Henry Hoovers and which Henry Hoover is best for you. The head of the Henry Hoover family, Henry the Hoover is certainly the most well known vacuum in the Henry range. First introduced in 1981, Henry’s smiling face has been helping people to clean their homes ever since. Whilst Henry is probably best known for this appearance – something which has helped to make something of a celebrity and household name – it shouldn’t be forgotten that he is also a very capable vacuum. Whilst the look and feel of Henry has remained pretty similar over the years, a number of tweaks have been made to improve his performance, ensuring that Henry continues to be the go to hoover for many homes and workplaces. 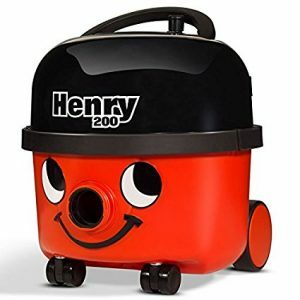 Despite a significant reduction in Henry’s motor power, improvements in efficiency means he remains a powerful and reliable vacuum, suitable for cleaning all types of services. Henry has also been built to be long lasting, meaning he should last in your home for years to come. With a range of useful accessories coming as part of the Henry package, no cleaning job should be too hard. The Henry Hoover weight comes in at 8kg, so whilst not light, he can be moved around your home fairly easily. You can’t really go wrong with the Henry. As an affordable vacuum we don’t think you’ll be disappointed. For a more detailed look at Henry, check out our Henry Hoover review. The female equivalent to Henry or also known as the female Henry Hoover, apart from her appearance Hetty Hoover is exactly the same vacuum. The only real difference is that Hetty is pink compared to Henry’s traditional red. She also comes complete with eyelashes to add to her more feminine appearance. Hetty smiles just as much as Henry, and in terms of performance is just as able. Just like Henry, Hetty has a highly efficient motor, a 10 metre cable and rewind storage system, and comes with a host of useful accessories. Numatic has more recently introduced another version of Hetty, that comes with a six litre bag capacity rather than the traditional 9 litre capacity. Both versions come highly recommended but we suggest you check which size Hetty you’re getting to avoid being disappointed. So if you’re after a very capable hoover that comes complete with a feminine appearance, Hetty the Hoover should be perfect for you. For a more detailed look at Henry, check out our Hetty Hoover review. 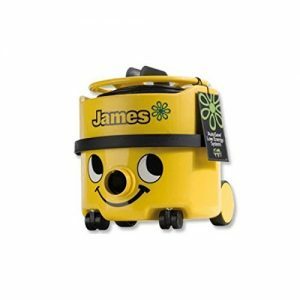 The frugal member of the Henry Hoover range, James Hoover is a slightly smaller vacuum than Henry and Hetty, and comes with a couple of other alterations. Yellow in colour, James has a slightly smaller bag capacity – eight litres rather than nine – than that of Henry, his more famous family member. But in terms of performance there is no noticeable difference with the same motor size as Henry and Hetty; it’s once again a very capable machine built by Numatic. Another factor that allows James to be smaller is the cable tidy that can be found on the top of his head, which means you can manually wind the cable by hand. 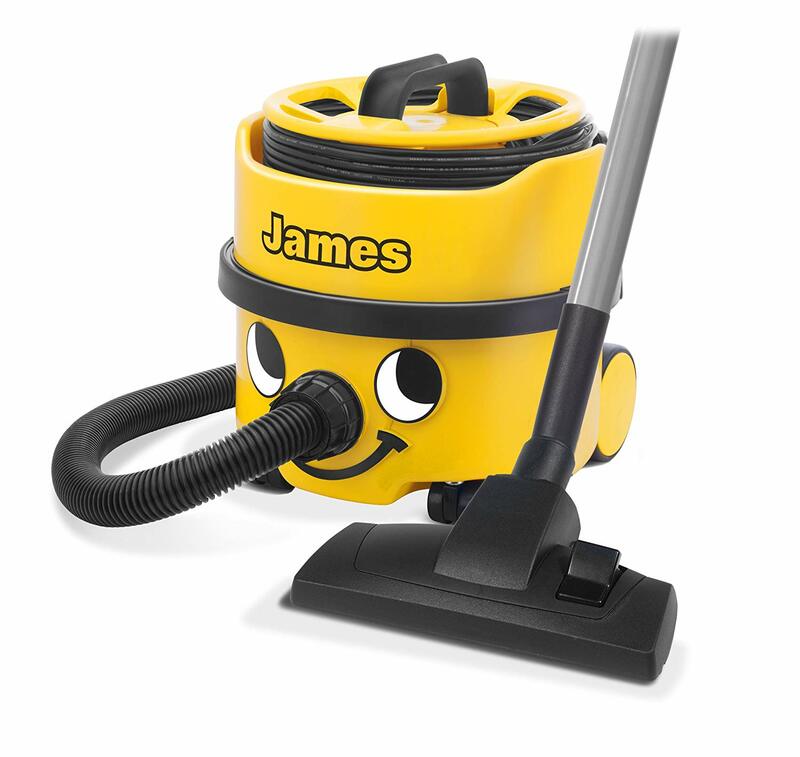 Where James stands out over the rest of the Henry Hoover range is the unique caddy tray that can also be found on the top of his head, providing a great storage place for his attachments that includes the crevice tool and the upholstery brush. If you want a slightly smaller Numatic vacuum that still packs the same punch as its larger compatriots, than James Hoover could well be the one for you. For more on James, see our full James Hoover review. If you have pets in your home or workplace, than Harry Hoover is likely to be the best suited vacuum from the Henry Hoover range for you. Despite being very similar to Henry in terms of performance, where Harry really comes into his own is the additional changes that have made to help him specifically tackle stubborn pet hair. Green in colour, Harry comes with an additional Hairo brush which is perfect for picking up pet hair from both floors and upholstery. He also comes with a special Micro Fresh filter which helps to minimise odour that pets can create. Despite having the same bag capacity, Harry weighs slightly heavier than Henry and comes with a less powerful motor. But his general performance is still very good, and the added bonus of his performance with pet hair really helps him to stand out. For a more detailed look at Harry, check out our Harry Hoover review. George is the ultimate all-in-one vacuum, more than capable with both dry and wet vacuuming. 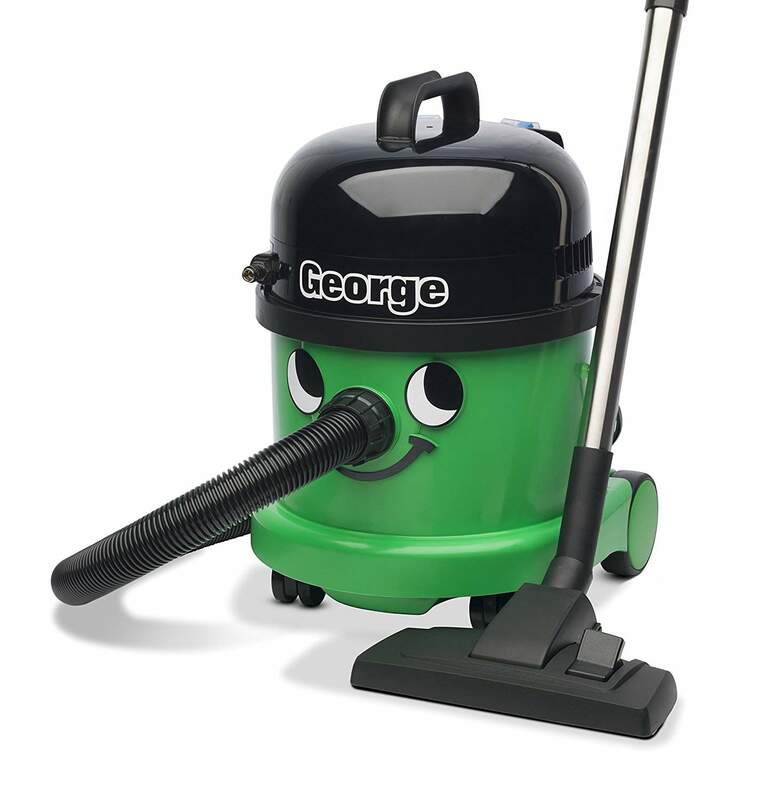 Like the rest of the Henry Hoover range, George is great at cleaning dry floors and picking up all sorts of dirt. But what really helps George to stand out is his ability with wet floors. Great at sucking up spills or just cleaning wet floors in general, George is also adept as a deep cleaner for all types of surfaces, including carpets and upholstery. Want to give your carpets a real clean with special shampoo? No problem if you’re using George. 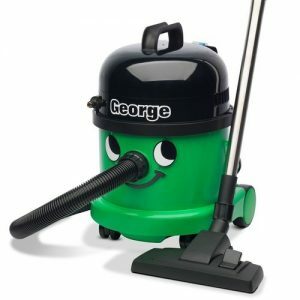 George is also much more powerful than the standard Henry Hoover, so he’s great at picking up stubborn dirt that a less powerful vacuum might struggle with. With a huge 15L bag capacity for dry cleaning, and a more than adequate 9L capacity for wet cleaning, George also has plenty of room so you don’t need to be emptying him too regularly. He is slightly heavier than most of his family, but it’s worth it for the extra capacity and more powerful motor. So if you’re looking for an all-in-one vacuum that’s great at both dry and wet vacuuming, we really think George is your man. Read our in-depth George Hoover review. George’s younger brother, Charles is another all-in-one vacuum that can tackle both dry and wet surfaces with ease. With the same powerful motor as George and the same dry and wet bag capacity, other than his blue appearance the differences between George and Charles aren’t obvious. However, Charles is ever so slightly lighter than George and doesn’t come with as many accessories as his older brother. The main thing missing with Charles when compared to George is the extra carpet / upholstery cleaner. If this is something you require, then you’d be better off going for George, but if it’s something you don’t feel you need, then Charles is the man for you as he’s generally cheaper than George. If you to decide Charles is your man, you’ll be getting a great dry and wet vacuum with plenty of bag capacity. The fact he’s also a bit lighter than George means he’s easier to manoeuvre and carry around. 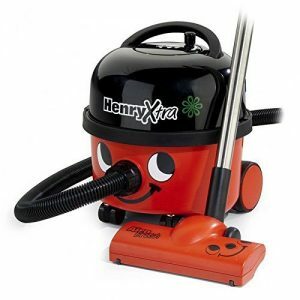 The Henry Xtra (sometimes known as Henry Extra Hoover) is an enhanced version of the original Henry. You may be wondering that’s the difference between Henry and Henry Xtra? The Henry Xtra takes all the fantastic features from the original Henry Hoover and adds some added extras on top. Without doubt the stand-out Xtra is the unique Airobrush, which is great with pet hair and also helps to provide a pristine clean on soft surfaces like carpets. However, just like Henry, the Henry Xtra is also more than capable on hard floors too, with the hard floor brush great at tackling all types of hard surfaces including laminate and wood flooring. Henry Xtra is slightly heavier than the original Henry despite being slightly less powerful, but the added accessories do make it an attractive vacuum, especially for those with pets and hard and soft flooring. It is slightly more expensive than the original Henry, but if you want an upgrade on your original Henry then it may well be the ideal vacuum for you. There are a range of Henry Hoover accessories that you can purchase as either add-ons or replacements. Whilst the vacuums from the Henry Hoover range are durable and long-lasting, you are likely to require replacement dust bags after a period of use and may also benefit from some of the many accessories that can help your vacuum to perform that little bit better. Despite having large capacities and strong, durable dust bags, there will come a time when you will need to replace the dust bags within your Henry vacuum to ensure they don’t start leaking dirt into the vacuum drum. These Henry dust bags come in a set of 10 and are compatible with all vacuums from the Henry Hoover range. 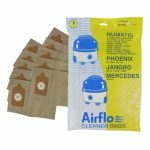 You can also purchase these HEPA Flo bags which are great at dealing with smoke, pollen and pet debris which can lead to allergies if not prevented. 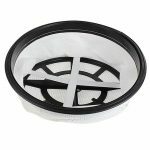 These bags trap air particles inside the drum, meaning they can’t escape and spread around your home. Although the built-in filter in Henry Hoover vacuums are built to last, after repeated use their may come a time when you need a replacement. Purchasing a replacement filter can help to keep your vacuum working efficiently, and save you the cost of buying a replacement hoover. This replacement filter is perfect for Henry and George vacuums. 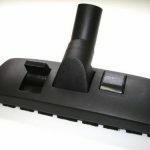 There are a number of additional Henry Hoover brush tools you can purchase to help your Henry vacuum clean more efficiently. Whether you want a replacement brush tool or just want to get an accessory, there’s plenty of useful brush tools available. The stand-alone carpet brush tool is a retractable feature that is best suited to cleaning carpets, but it’s also pretty handy on hard floors too. Another useful brush tool that you can buy is the Airobrush tool, which is a strong performer thanks to its roller brush action which is operated by the suction of the air from the vacuum. This Airobrush is compatible with all vacuums from the Henry Hoover range. There’s also the Henry hard floor brush and the Henry soft dusting brush, which are useful attachments based on the type of surfaces you tend to clean. Summary – which is the best Henry Hoover? It’s difficult to say which is the best vacuum from the Henry Hoover range as it all comes down to what you require. 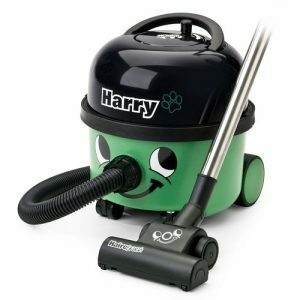 The standard Henry and Hetty vacuums are great little hoovers that will get almost any vacuum job done with little fuss. Henry Xtra could be considered a slight upgrade, but you’ve also got Harry and James which have some small alterations to the traditional Henry. If you need an all-in-one vacuum, then George and Charles are the best suited. With such a large range it is tough to pick a favourite, but with all these hoovers coming from Numatic you’ll be getting a fantastic vacuum which ever you decide to go with. James Hoover is a member of the Henry Hoover range. James has similarities to Henry but has some differences too, and and it's not just his colour. George Hoover is an all-in-one, wet and dry vacuum cleaner from the Numatic Hoover range. George is capable of almost any cleaning job thrown at him. 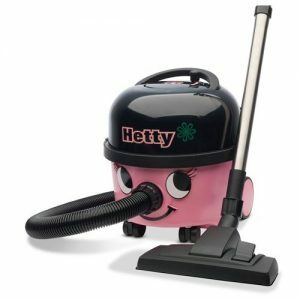 She may not be as famous as Henry, but Hetty hoover - otherwise known as the pink Henry vacuum - can certainly pack a punch when it comes to cleaning. Numatic's Harry Hoover is less well-known than the famous Henry, but is the Numatic vacuum of choice when it comes to pet hair.